The Head Game keeper Gavin Hannam of Glen Lethnot estate checks the guns.in the build up to the Glorious 12th, the official start of the red grouse shooting season (this year Monday 13th August) ANGUS, SCOTLAND AUG 10 ..The Glorious Twelfth is usually used to refer to August 12, the start of the open season for grouse shooting in the United Kingdom. 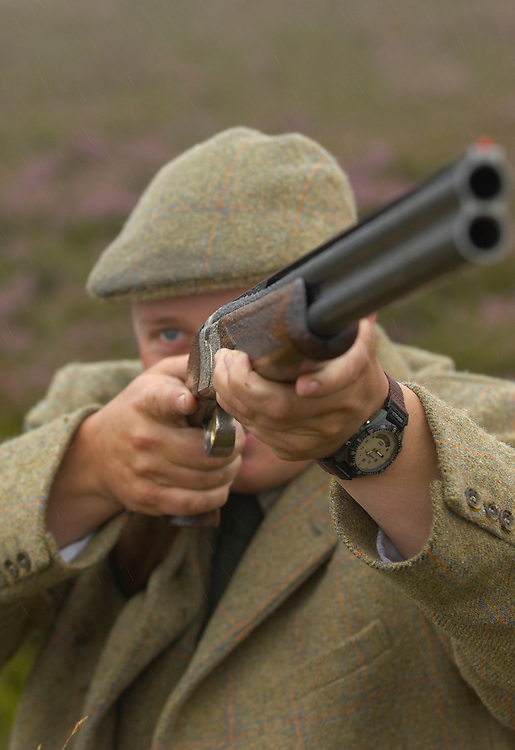 This is one of the busiest days in the shooting season, with large amounts of game being shot. It is also a major boost to the rural economy. ..Since the start of the season traditionally does not begin on a Sunday, it is sometimes postponed to August 13, as in 2001 . In recent years, the event has been hit by hunt saboteurs, the 2001 foot and mouth crisis (which further postponed the date in affected areas ) and the effect of sheep tick and the gut parasite Trichostrongylus tenius...The Game Conservancy Trust conducts scientific research into Britain’s game and wildlife. Advising farmers and landowners on improving wildlife habitat and lobbying for agricultural and conservation policies based on science..Many of their supporters take part in field sports.